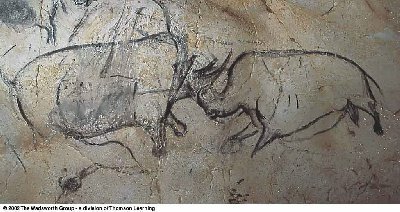 Cave art from Grotte Chauvet, France. Bear (left). Aurochs and rhinoceros (right). Source: Understanding Physical Anthropology and Archaeology, 8th ed. "Where did Homo sapiens come from?" "How did they interpret their world?" "And what did they think and feel?" "Were they anything like us?" This program seeks to profile modern humankinds distant forerunners through the research of ethnologists Bernard Saladin DAnglure and Valentina Gorbatcheva, archaeologist Sergei Vassilév, historian Jean Clottes, linguist Merritt Ruhlen, anthropologist Bernard Vandermeersch, geneticist Michael Hammer, and ethnoarchaeologist Polly Wiessner. in shamanistic societies people often believe in the idea of "parallel worlds"
"genetic variation in humans today"
"Economics, social organization, arts, religion, burial customs, they all existed in some form in 'The Stone Age' [the Paleolithic] and they still exist today." ". . . intiuition is linked to knowledge, knowledge to mind, and mind to language." "In short, we have entered a world where thought permeats everything, and this certainly is one of the legacies of Homo sapiens." "With antlers and bones you can make all sorts of things"
"Bushmen (Khoisan; !Kung; "Bushmen"; Tsuntwasi) Today"
Were they anything like us?